The Sun is an open fusion reactor, which turned every second about 600 million tons of hydrogen into helium (proton-proton chain), with the release enormous amounts of electromagnetic energy-solar energy that is sent into the space (discovered in 1938 as Hans Bethe). From a total of 3.8 × 10e26 W radiated energy by the Sun in the universe, the Earth receives 1.75 x 10e17 W. About 30% received energy Earth reflects back into space, about 47% is converted into heat energy, and about 23% goes to the process of water circulation. Much of the solar energy that reaches the surface is consumed in photosynthesis. Even fossil fuels are a form of accumulated solar power: oil, gas and coal. Earth receives more energy from the sun in just one hour than the human population uses for one year. The total solar energy absorbed (sometimes is just said solar power) in the Earth’s atmosphere, oceans and land is about 3,850,000 EJ per year. The amount of solar power that reaches the surface of the planet is huge, so large that in one year is two times greater than all of Earth’s non-renewable sources of energy (green energy). 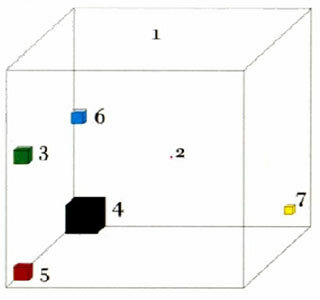 If we imagine, Figure 1, the volume of cubes and bring it in an analogy with the energy of the Sun that reaches the Earth in one year (1), comparison with the reserves of primary energy sources and the total annual world consumption of energy (7) reads as follows: all reserves of coal (4), natural gas (3), oil (5) and uranium (6) together. The amount of solar energy currently used shows the smallest cube (2). According to this illustration, solar power is not exploited enough, but it could be expected the improvement of this situation. As the cleanest source of energy, life on Earth has an opportunity for sustainability and survival if we start using it more. 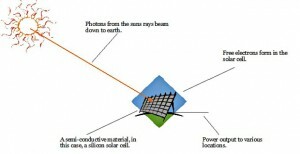 In addition, this “fuel” source in future will meet environmental requirements, and practical needs: like applications in many spheres of life, making a life and work of man easier (such as solar cells, solar panels and solar collectors as energy sources in the inaccessible regions of the planet used in off-grid systems).